Sophomores Miranda Montes pitches while Carina Sanchez scans the outfield. 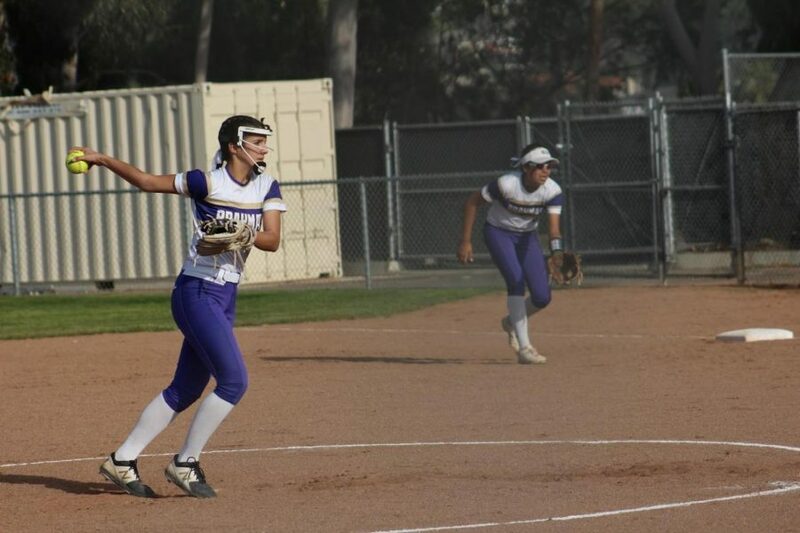 So far, the Diamond Bar High School varsity softball team has encountered more problems with the weather than opposing teams. One of the biggest challenges that the Lady Brahmas has faced early on in their season has been the rain, according to head coach Kurt Davies. “The biggest challenge thus far has been the rain and trying to reschedule games and get games in. Right now we are trying to figure out the best lineup that we can but together and with the inconsistency of play it’s hard to do that,” Davies said. Other than that, the team has a record of 7-2 and a league record of 4-1. In the first game of their season, the girls won against Villa Park, 6-2. In their next game they had a blowout win 11-0 against Bellflower. After that, things took a quick turn and the team’s win streak ended when the ladies played rival Walnut. The girls played a close game, but ended up losing 4-3 to the Mustangs. To bounce back from the loss to Walnut, the girls defeated West Covina, 4-3. On Friday, the Brahmas shut out Montclair, 8-0. In its game against Chino Hills, the Bahamas suffered a tough loss 12-4, but the girls quickly bounced back and they have recently been on a winning streak, defeating Ontario, Chaffey and Don Lugo. “Softball is a game where each player makes an impact. Trusting each other and having the same goal in mind has helped us execute in certain situations leading us to wins,” Ruhl said. Davies said that the coaching staff is still trying to figure out the best lineup for the team. Because of the young talent on the team, Davies is testing out what lineup works best. “We have a fairly young team, with only two seniors, but as a whole we are very optimistic about the year and we think this season is going to be exciting,” Davies said. In a crucial game for the team, the Brahmas face Chino, the top team in the Mt. Baldy League, this week. “This is going to be a big season for us. We’ve been working hard since fall and we have a very good chance at taking league,” Rhul said.